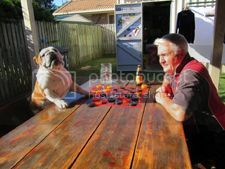 English Bulldog News Forums - June 2012 Dads & Bullies Photo Contest Winners! 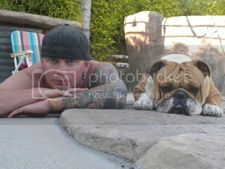 June 2012 Dads & Bullies Photo Contest Winners! The 4 Paw Members have cast their votes, I believe this was a record voting month too (Thank you 4 Paw Members!) and the results are in! Congratulations to boomsboo, the winner of our Dads & Bullies contest! We have a tie for runner up! Congratulations to both Ftse 100 and Sargesmom for being Runner-Up! Congrats to all three of you ............. love all those pics!!! Yay! Congrats to all you bully dad's! Great photos!! YAY!!! Tank is so happy that he won finally!!!! (I think his Dad is happier though :hahaha thanks to everyone who voted for us and congrats to the runnerups! Woohoo three of my five pics won. Congrats to the winners! Congrats to all the winners, great pics. Wondeful pics! Teo o those three were my top picks! Congrats! Congrats to Tank on winning and to Sargesmom for Tying with Ftse for Runner up, I feel so lucky that Ftse got a place as all the photos entered were great. Congrats to our winning dads! 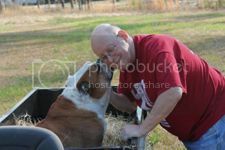 Everyone had great pics - it's always so hard to vote...Great participation bully lovers! Congrats to everyone! Great pictures for sure ! That was my favorite pic of all, even more than my hubby's pic, lol. Congratulations, it's a wonderful photo! And a big congratulations to FTSE and Sargesmom for the runner up.